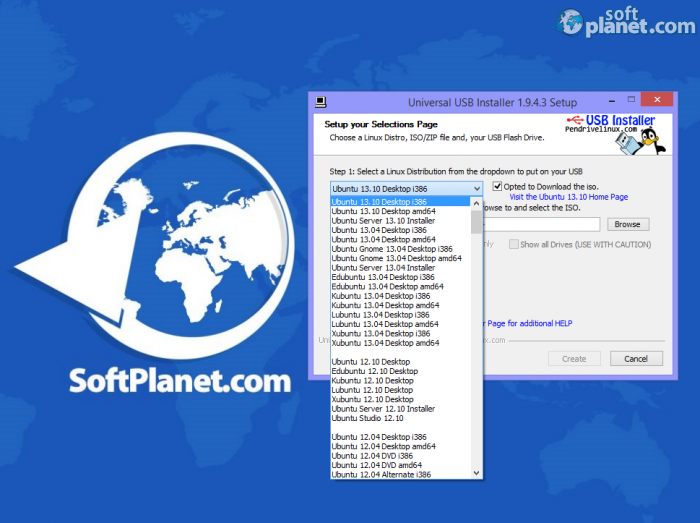 SoftPlanet makes it possible for everyone to get free Universal USB Installer download directly from our servers. There is no registration needed for downloading. Helps you install Linux on your USB or flash drive. Have you ever heard about Ubuntu, Kubuntu, Xubuntu or Linux Mint? If not, these are all computer operating systems which are free and open source distributions. Typically Linux is packaged in a format well-known as a Linux distribution for desktop and server use. Because this OS can be distributed freely anyone may create as many copies as needed to achieve its intentions. Universal USB Installer 1.9.5.4 is a free application with which help you can create a bootable USB or flash drive with your favorite Linux version. You can download Universal USB Installer from here or from the developer's website. Universal USB Installer does not have any special features or options. Its main purpose is to do what it stands for and that is it. The only thing you can opt in or out is the Download ISO check-mark box. Much more important are the requirements related to the USB drive. It must be formatted as FAT16, FAT32 or NTFS otherwise Syslinux will fail. The end result of that will be that your drive will be not bootable. You can use the program on Windows XP, Vista, 7 and 8 OS to create your USB drive but this app is not compatible with the older Win 98 and 2000 versions. Another requirement that Universal USB installer has is that your computer has to have a BIOS version which can boot from a USB device. When you launch the application you will be introduced to the main and only one screen which you need to see before you can start the creation process. In the first step you have to select a Linux distribution from the drop-down list which you want to be set on your USB drive. There is an optional check-mark if you want to download the distribution ISO file locally. If checked a pop-up window will warn you that you need to wait until the download process is over before you can take the second step. In that step you browse your PC and select your desired Linux distribution. In the third step you select your USB flash drive letter only. This selection enables the Create button and by pressing it you activate the program. Then the second window with the progress bar shows up and you can monitor there how the entire process is going. At the end a message in the bottom of the screen will notify you that the installation process is complete. Universal USB Installer has a link on its main window which redirects you to the developer's website for additional help. There you can see all the supported versions, any issues, fixed bugs and check some useful links. 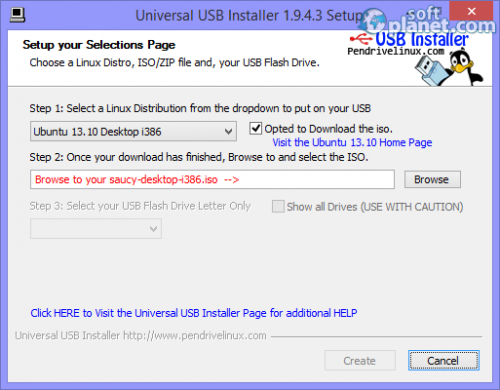 Universal USB Installer 1.9.5.4 is one of the quickest ways to achieve your goal of creating a bootable Linux distribution. The number of the supported versions can impress any possible user but this is why this program is one of the best and easiest ways to achieve your goal. Universal USB Installer is VIRUS-FREE! Our security scan shows that Universal USB Installer is clean from viruses. The current version of Universal USB Installer has been scanned by our system, which contains 46 different anti-virus algorithms. That ensures that Universal USB Installer 1.9.5.4 is 100% safe for your computer.